Safety transformers, encapsulated in self-extinguishing epoxy resin, compliant with european standards EN61558-1 and EN61558-2-6. Read the technical notes The 50/60Hz transformers defined in the catalogue as “safety transformers” meet the harmonized European standards indicated on the related pages. They are manufactured with high quality material and with manufacturing processes developed in a 20 year old experience; this is guarantee of very high quality and reliability. The tests of the functional parameters and of the dielectric strength between primary and secondary windings, carried out on every single item, practically eliminate any rejects on production lines. The position of the primary and secondary windings in separated chambers and the encapsulation in epoxy resin make these transformers particularly safe and strong, both mechanically and electrically. They moreover withstand atmospheric pollution such as dust, humidity, and so on. The use of pins made of tin-plated phosphor bronze make them very resistant and very easy to weld. 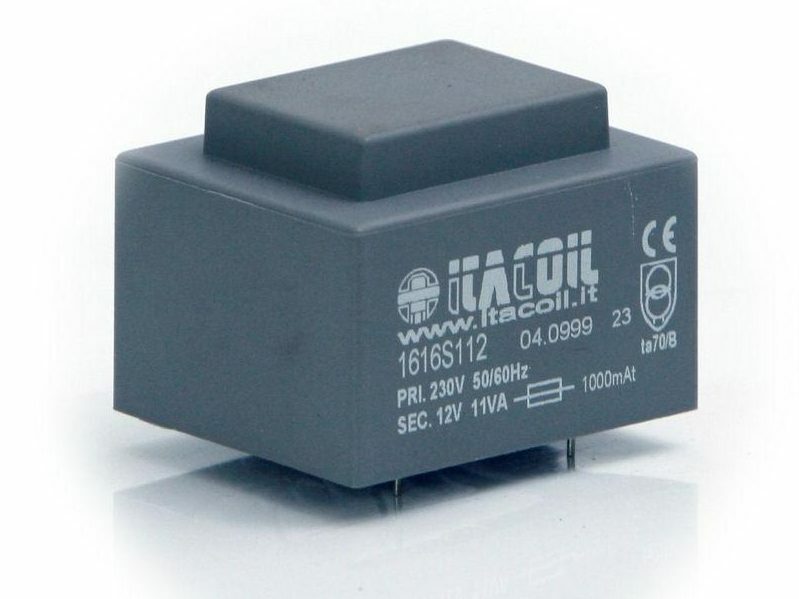 - Inherently short-circuit proof: the transformer which undergoes a short circuit under the conditions foreseen by the standard does not reach, in the short period, temperatures which may be dangerous for the material it is made of. - Output fuses: in order to prevent overload or short circuit from reaching dangerous temperatures, the transformer has to be protected by means of a fuse delayed by the value indicated on each secondary output; for transformers up to 30VA the fuses must comply with the standard EN60127.2.3 (e.g. series ST523 Omega); for transformers with higher power the fuse must comply with the standard EN60127.2.6 (e.g. series VT521 Omega). As in the EN61558 the primary voltage is subject to tolerances +/-10%; the rated output of the transformer shall be selected accordingly. ITACOIL s.r.l. | via delle Gerole, 7 | 20867 Caponago (MB) | ITALY | p.IVA, c.f., reg. impr. MI 03071100964 | cap. soc. 81600€ i.v.